The Prime Minister's fantasy task of Gogha-Dahej Ro-Pax Ferry benefit is all prepared to begin under the Sagarmala program of the Ministry of Shipping. 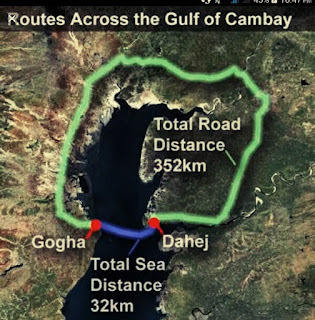 In a fruitful preliminary run led as of late, 12 stacked trucks were transported by the Ro-Pax ship from Dahej to Gogha over the Gulf of Cambay, by means of the ocean course. The land course between the two spots includes a 294 km or 8 hour drive. The Ro-Pax benefit diminishes this separation to only 31 km through the ocean course by intersection the Gulf in Cambay in 17 Nautical Miles. The movement time gets diminished to only 1.5 hours. This is an imperative advancement for precious stone and materials dealers and specialists in Surat to travel by means of beach front sending and spare the movement time considerably. The completely operational Ro Pax benefit with conveying limit of 100 vehicles and 500 travelers will be opened on 27 October 2018. Talking after the trail run Shri Nitin Gadkari, Union Minister of Shipping, Road Transport and Highways and Water Resources, River Development and Ganga Rejuvenation stated, "The Sagarmala program is contacting the lives of individuals. Gogha-Dahej Ro-Pax Ferry benefit is good to go to interface Saurashtra and South Gujarat." The aggregate expense of the undertaking is assessed to be Rs 615 crore of which Rs.117 crore has been financed by Central Government under the Sagarmala program with the primary target of advancing Coastal Shipping and lessening coordinations costs.